The display is 'write only' which means that it only needs 3 pins to send data. 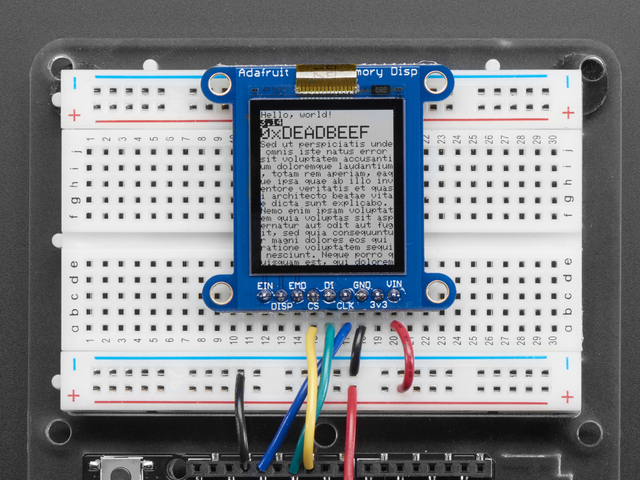 The downside of a write-only display is that the entire memory must be buffered by the microcontroller driver. If you have one of the older 96x96 pixel versions, then 96x96 bits = 1,152 bytes. On an Arduino Uno/Leonardo that's half the RAM available and so it might not be possible to run this display with other RAM-heavy libraries like SD interfacing. If you have one of the newer 168x144 pixel versions, then 168x144 bits = 3,024 bytes. That won't fit on an Arduino Uno or Leonardo! You must use a chip with more RAM like a Metro or Feather M0 or ESP8266. The Sharp Memory Display breakout board ships with optional headers for use in a breadboard. This guide was first published on Jun 22, 2013. It was last updated on Jun 22, 2013. This page (Overview) was last updated on Apr 17, 2019.